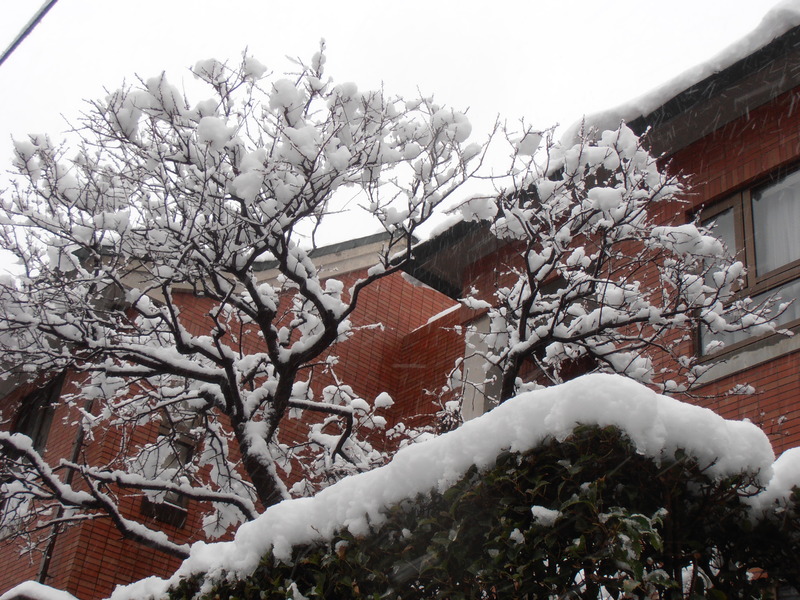 At church yesterday a fairly new Tokyoite asked us about winter here. How cold does it get? About freezing, we answered. And snow? Oh no, we assured him, we hardly ever have snow, and when we do it doesn’t settle. Twenty-four hours later, and . . . oops. According to an app on my phone the temperature is 1 degree celsius but ‘feels like -7’, and according to a tweet from the UK ambassador we had 3 inches of snow in 3 hours. The transport system is affected; many flights out of Haneda are cancelled and some train lines have stopped. I watched the snow get deeper and deeper this morning and by early afternoon I decided to go for a walk, since we very rarely have a day like this. Fortunately, today is a national holiday; the second Monday in January is Coming of Age Day (成人の日). It used to be that the ceremony was only for people who had already reached their twentieth birthday, but in recent years it has changed and is now for anyone who has turned or will turn twenty between April 2nd last year and April 1st this year. Also, it used to be held on January 15th and so was a moveable feast, but in 2000 the Happy Monday system was introduced and four National holidays, including Coming of Age Day, were moved from a specific date to a specific Monday every year, to create some long weekends, and therefore, happy Mondays. So, good for most of us, it means we don’t have to work today, not so good for all those new adults who have been trying to get somewhere to mark the occasion. Traditionally, they are invited to the city or ward office to listen to speeches and be congratulated, and then go out with friends or family to celebrate. Men can wear hakama (袴), formal kimono for men (and very smart, too) but can also wear a western suit. 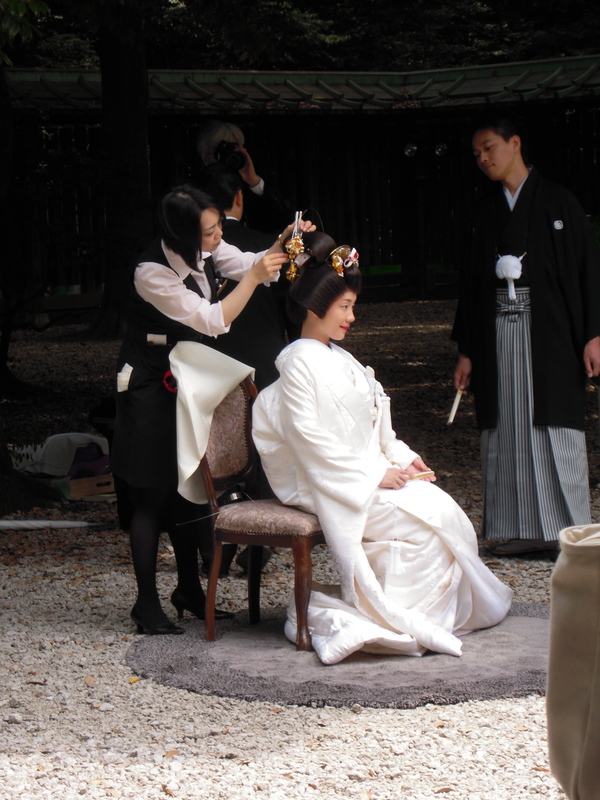 This photo, of a bride and groom, actually, will give you an idea, since the groom is wearing a hakama. Apart from them, I saw quite a lot of people out in the snow. There were some university students chasing each other along the road having a snowball fight, and a primary-school-age boy came out of his apartment building dragging a bright red sled with a look of absolute delight and chattering excitedly to himself about the wonders before him. I walked across the railway tracks and saw a train waiting at the station. 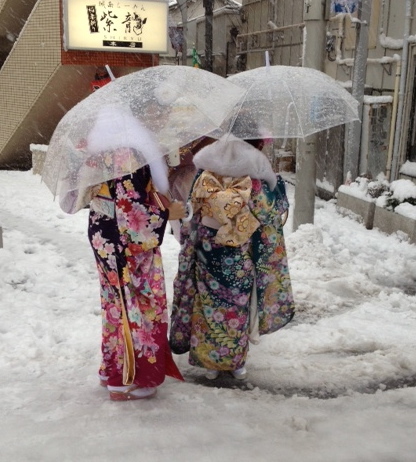 A little further along I saw the two young women in kimono. Just a few metres past them, the pachinko parlour was open, and one of the employees was hosing down the road in front. I saw a lot of shops and other businesses trying to clear the bit of road in front of their building, but usually with a shovel or a broom. This was the only place using water to blast the snow away, but with temperatures hovering around freezing it seemed like a recipe for disaster. I walked along the shopping street as far as the supermarket. By then my toes were cold, so I was happy to find it was warm and toasty inside. I didn’t really need to go shopping today, but I bought some mikan (tangerines) and extra vegetables and tofu to add to my green curry this evening. On the way back it seemed like the snowflakes were a little smaller and wetter, but there was an icy wind making everything feel colder. Back across the railway tracks, and the same train was still at the station, with announcements being made that one of the lines had stopped, at least. I trudged back up the hill to my apartment and was relieved to get home, have a mug of hot chocolate and settle down to write this post. I thought I could hear that the snow had turned to rain, but when I went outside to check I found it’s still snowing but it’s quite wet now. Tomorrow we’re all back at work, we’ll have to see if everything freezes overnight and what effect that will have, but for now I’m going to stay warm and snug at home. 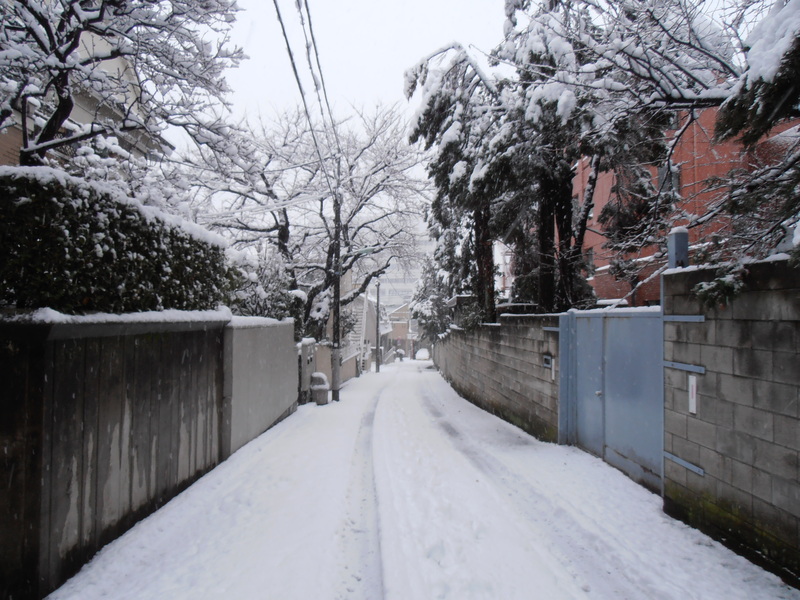 This entry was posted in Japan, Japanese national holiday, Tokyo, Tokyo walks and tagged Coming of Age Day, January 14th, Japan has four seasons, snow, Tokyo, 成人の日 on January 14, 2013 by tokyopurplegirl. On my way home from church today I read a BBC article about a journalist who is going to spend the next seven years walking from the Rift Valley to Tierra del Fuego, following in the steps of the first humans as they spread from Africa across the globe. You can read the whole article here: http://www.bbc.co.uk/news/magazine-20902355. Of course, it’s a huge undertaking, with some parts fraught with danger, and he will have a lot of support even if he is largely walking alone or with local guides. What struck me, what stuck in my mind, was the idea that our brains have evolved to absorb information at 3mph / 5kph, or the average walking speed. Now, I am no scientist, so I can’t say if this is correct, but the concept appeals to me, because this is how I like to soak up the sights and sounds of Tokyo. I have already written a number of posts about walking in Tokyo. Although this is a huge city with an enormous population, one of the 21st century’s megacities, Tokyo is really not so big and much of is it easily walkable; it’s largely flat, it’s not hard to find a roadside map and if you are map-challeneged like me you can always ask someone. There are three kinds of walks I enjoy; following railway lines, walking around neighbourhoods and pilgrimage routes. Over ten years ago, I got the idea, I don’t remember from where, that I would like to walk around the Yamanote line in one day. The Yamanote line is the overground loop line around Tokyo. It is 34.5km long and carries over three and a half million passengers on an average day. There are twenty-nine stations and a full loop takes approximately one hour. Anyway, I was taken with the idea of an urban hike and luckily for me it also appealed to a friend who agreed to do it with me. It took fourteen hours (including breaks) and is probably the topic for a post all of its own, but it was that mammoth trek which confirmed for me that the best way to see the city was on foot. That day, when the cherry blossoms were in full bloom, is still clear in my mind, even over a decade later. Three years ago we repeated the walk, on the last day of the year; we shaved a couple of hours off our previous time and counted off each station as the remaining hours of the year ticked away. Same blisters though. Even before that walk, I had enjoyed exploring different areas of Tokyo, Yokohama and Kamakura; there are a number of guidebooks available. Yanaka became a favourite, but wherever I walked I always discovered something ; a century-old rice cracker shop, where the third and fourth generations of a family were working; a shop selling a skin-whitening treatment made from nightingale droppings; traditional Japanese houses, modern architecture, and the occasional Swiss chalet. So much of Tokyo is small neighbourhoods, with local parks and shrines and temples tucked in with everything else. The pilgrimages are a relatively new discovery for me. I did the Yamate route for the first time only a few years ago, but am excited to find a new way to explore. I have only done two out of the twenty-four so far, but I intend to do more. After we completed that first Yamanote line walk we returned a few weeks later, armed with coffee from a nearby Starbucks (not nearly as easy to find as it is today) and did a victory lap. Our fourteen-hour marathon was condensed into a one-hour swoop around the city. That, too, is a fascinating view of the changing cityscape, and an easy way to give a visitor a brief idea of all that Tokyo is. Nothing can compare, though, to just walking and looking, feeling your feet on the ground, knowing that you are just a tiny part of a vast city. 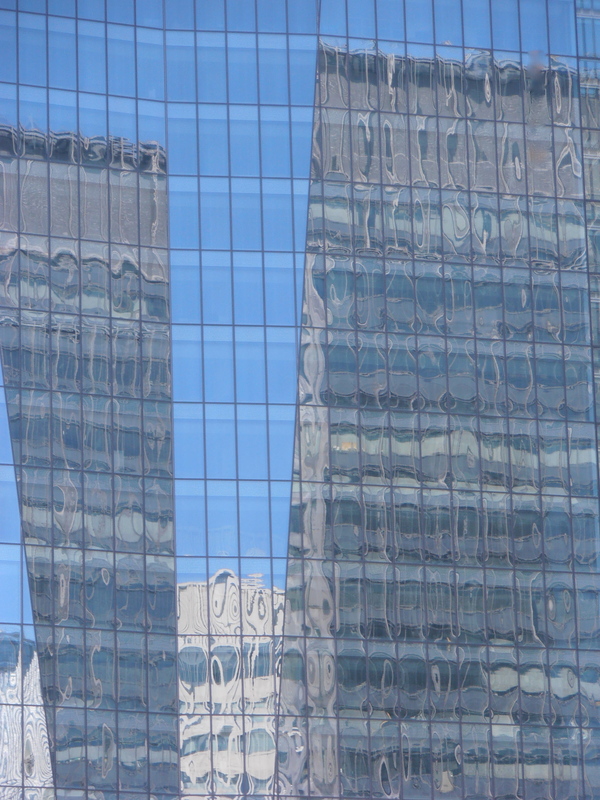 Whether you are in Tokyo or elsewhere, it is a rewarding way to spend an hour or more. Slow down, take in the world at three miles an hour. Sometimes, you can see more by doing less. You can go further by traveling a shorter distance. Even in a big city, finding the places that appeal to the senses, that take root then resonate in memory no matter how much time has passed; this is how I have nibbled Tokyo bit by bit, and have found ‘my’ Tokyo, the one that reflects all the reasons I have made it home for so long. This entry was posted in Japan, Tokyo, Tokyo walks and tagged Japan, seven lucky gods, Tokyo, Yamanote line, 山手線, 一期一会, 七福神 on January 13, 2013 by tokyopurplegirl.